Phi Theta Kappa is the official international honor society of the two-year college that promotes scholarship, leadership, service, and fellowship. 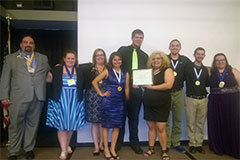 We are the Alpha Sigma Xi Chapter at Columbia Gorge Community College (CGCC). Students who have established a minimum cumulative GPA of 3.3 after 12 credits of Associate degree coursework at CGCC are invited to join. You will have your membership benefits for life! There is an application to fill out and a one time $85 membership fee. You pay that one time only and you are a member for life. You can pick up the application 281 KB and pay your dues at Students Services. Are you interested in finding out more about your CGCC Chapter, Alpha Sigma Xi? Visit us on Facebook! Stop by the Student Life Center in Building 1, Floor 2 across from the library to talk to us!